When David H. Geiger thinks about roofs, he thinks light. A master in the design of ultra-lightweight, air-supported fabric roofs, his latest idea - the cable dome - is self supporting. 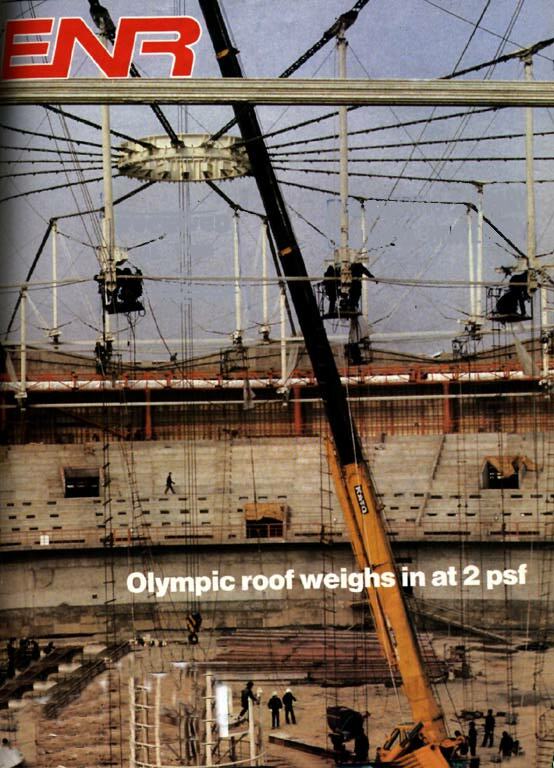 Two cable domes and their four-layer fabric cladding, erected recently for the first time at the Olympic Park in Seoul, Korea, weigh in at just 2 psf. 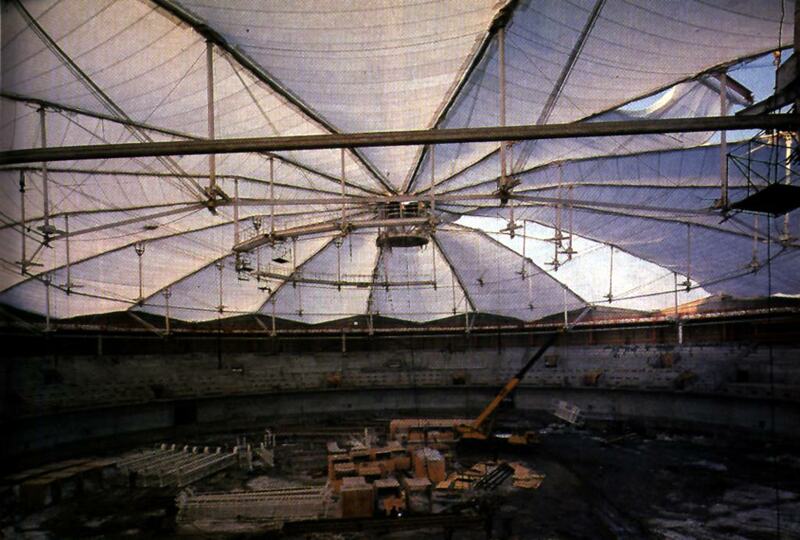 tensioned pulling the dome into position. Geiger Associates, New York City, had been looking for a system as economical as an air structure but without the need for a mechanical system for melting snow. "I had just been through the difficult winter when the roof deflated at the Hubert H. Humphrey Metrodome in Minneapolis, and I was working with an architect on a project in Vancouver who was interested in developing a structural system that had never before been built. I thought it would be a significant breakthrough if we could build what R. Buckminster Fuller called the tensegrity dome," Geiger says. Fuller was fascinated by the tension forces that he observed in nature. "Structural analysis is predicated on compressional continuity and nature doesn't use it ever," he wrote in his last published his book in 1983. He sought a system that would "progressively reduce the aspect of compression in a structure." He dubbed his invention "tensegrity," meaning tensional integrity. Such a structure has "continuous tension throughout." Compression elements become "small islands in a sea of tension. 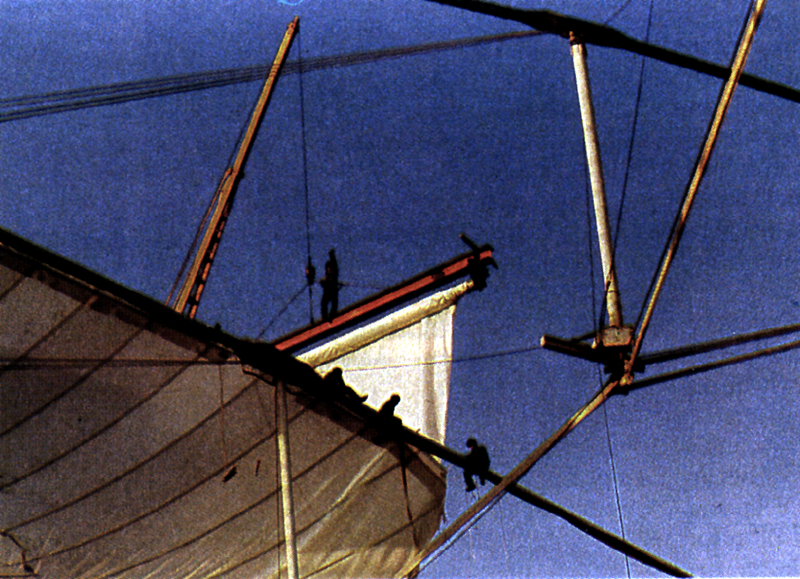 In Fuller's vision of tensegrity, however, the tensioned cables are triangulated. Geiger says, "We realized that the triangulation was not a necessary part of the cable structure. It adds a redundancy and a fine-tuning that you don't need and creates problems. We defined a new structure that was not triangulated but had the same properties." In Geiger's revision, space is spanned using continuous tension cables and discontinuous compression posts. 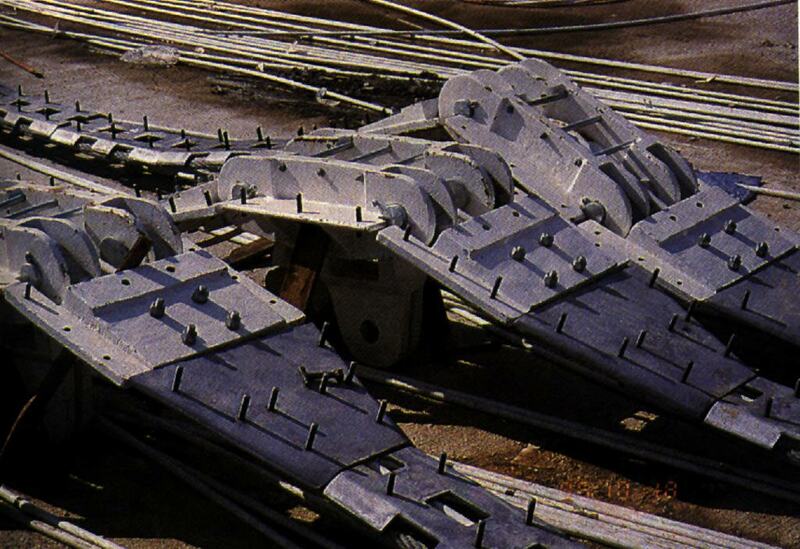 Loads are carried from a central tension ring through a series of radial ridge cables, tension hoops, and intermediate diagonals until they are resolved in a perimeter compression ring. 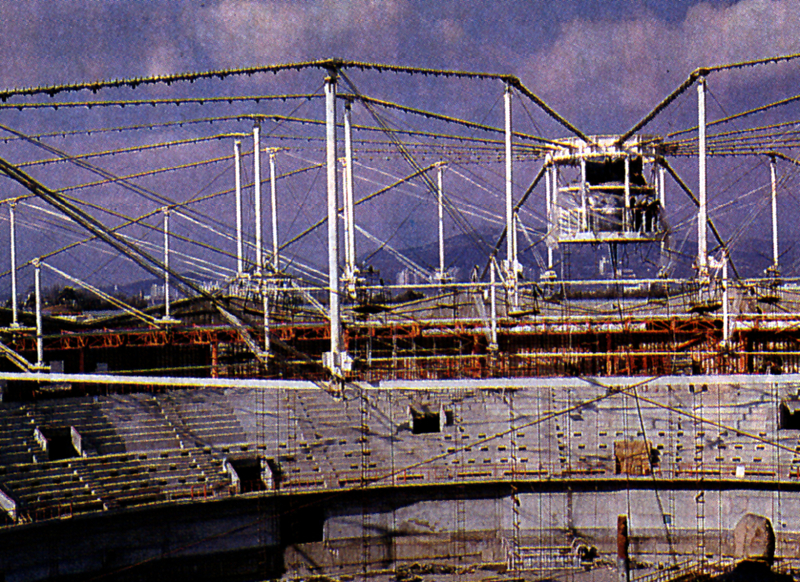 The concept didn't fit the bill in Vancouver, but it has been used in designs for arena roofs in St. Petersburg (ENR 3/1/84 p. 16), San Francisco, New York City and Seoul - where two domes are under construction at once. The cable dome "is one of the many firsts we want to show the world through the Olympics," says Lee Sung-Lim, a project supervisor at the Seoul Olympic Organizing Committee. Through the 1988 Olympics, Koreans say they hope to advance the stature of their country just as the Japanese did in 1964. The cable domes rising above a 13,000-seat gymnastics arena and a 7,000-seat fencing stadium are part of an Olympic Park that also includes a velodrome, arenas for weight-lifting and swimming events and the Olympic and press villages. The park is about 2 miles from the Seoul Sports Complex, the main venue for the games, on the southeastern outskirts of Seoul. The Koreans aim at spending $1 billion for the construction and rehabilitation of sports facilities at both sites, and many facilities are being readied early for the Asian Games this summer. 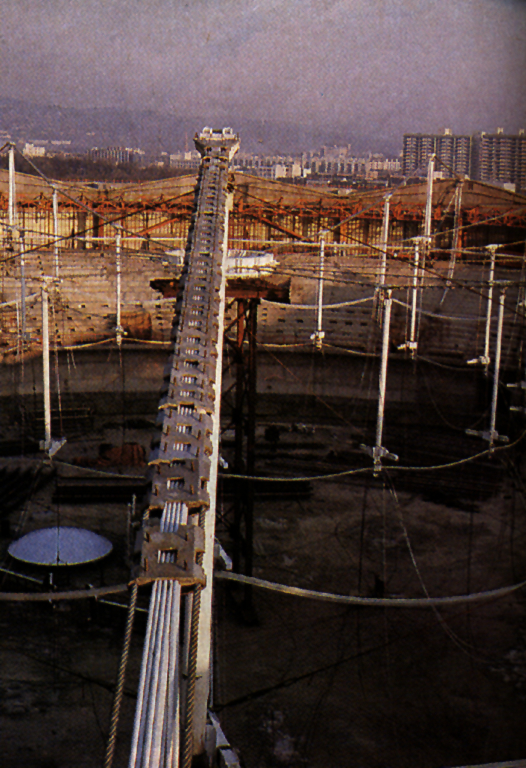 The prime mover behind the domes in Korea was Kim Swoo-Guen of Seoul-based architect The Space Group of Korea (SGK). The firm was invited to work jointly with the Environmental Planning Institute of state-run Seoul National University on the arena projects. 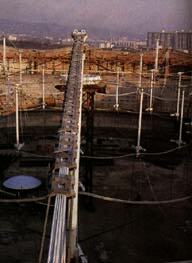 The architect on the fencing arena was Kang Kum-Hee Architects, Seoul. In approaching Geiger about the cable dome, SGK project architect Ryu Choon-Soo says the firm had in mind putting something ;'ultramodern" into the Olympic buildings to create a "combination of old and new" at the park, which is adjacent to an earthen castle from Korea's Paekje Dynasty dating back to 18 B.C. After agreeing on the design, Kim and Geiger still had to spend months convincing the city's 113-member advisory board and the Olympic organizing committee about technical feasibility and price. Kim negotiated with ODC Inc. Norcross, Ga., the manufacturer and fabricator of the silicone-coated fiberglass fabric and the cable system, to bring its contract down to $4 million - roughly $20 per sq ft. But that did not end the controversy. Geiger had to make a second trip to Korea to brief Olympic organizers about the technical feasibility of the new structure. 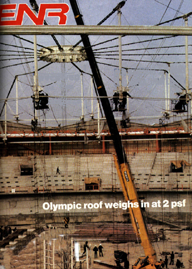 Back in New York, Geiger engineers were at work designing the 295-ft-dia, two-tension-hoop fencing dome and the 393-ft-dia, three-tension-hoop gymnastics dome to carry roof loads of 10.5 psf. "Geiger and I modeled the domes on the computer and thrashed the hell out of the designs," says Geiger associate Andrew R. Stefaniuk. "We found there are a couple of real advantages to the system." A major one is that as the size of the arena increases, the weight per sq ft remains constant and the cost per sq ft goes up very little, he says. Another advantage is that although Fuller's tensegrity domes had high-profile curves, the cable dome is suited to low-profile designs. Geiger's experience showed that low-rise domes have less uplift from wind and produce less drifting of snow and therefore lower snow loads. Geiger wanted lo keep the surface area of the domes to a minimum to reduce fabric costs, and he specified an off-the-shelf, seven-wire prestressing strand to reduce cable costs. as rings are tensioned one by one. at the bottom of the compression posts. Stefaniuk says one of the crucial parts of the design is the two sets of steel castings that connect the compression posts to the ridge cables and diagonals above and the tension hoops and diagonals below. "We had to assure the continuity of the cables that all start at the compression ring but are of varying lengths. And we had to keep in mind the eventual routes the cables would take," he says. "We tried eight or nine different designs before we found ones able to do the job." The engineers were also looking for reusability - making the casting design adaptable to smaller and larger domes, he says. One section of the upper casting is designed to resolve the imbalances of the loads and allow the dome structure to maintain its geometry. As well as engineering the cable network and patterning the fabric for the roof, Geiger developed an erection strategy for the structure. "We used the approach of asking ourselves how we would remove the strucutre in an orderly fashion if it were built and we wanted to take it down," Stefaniuk says. "Then we reversed that procedure." 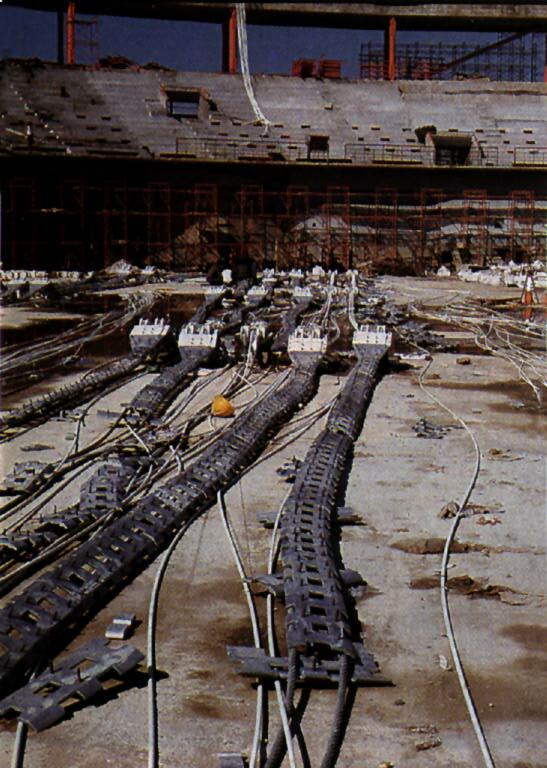 The 16 ridge cables that radiate from the center of each dome were laid out on the ground and threaded through the top casting of each compression post. 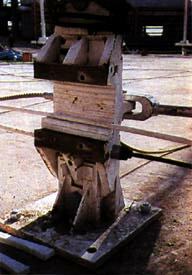 Geiger initially conceived of lifting the center tension ring directly from the ground. But Kim Jung-Soo, project manager for Korean erection subcontractor Woo Chang Construction Co., says his firm believes it saved four weeks of construction time by lifting the center tension ring by crane lo the top of a temporary central support tower. The ridge cables then spanned from the compression ring to the supported tension ring. The Seoul-based general contractors on the arenas are Sangyong Construction Co. Ltd. for gymnastics and Korea Shipbuilding & Engineering Co. for fencing. The bottom castings were temporarily bolted to the ground while the prestressing strands for the tension hoops were spun. The compression posts were then pinned into the top of the casting and the whole assembly was lifted into position "It's so light it can be hauled up by hand with come-alongs," Stefaniuk says. With the network hanging loosely in the air, two strands of the outer ring of diagonals, which run from the top of the perimeter compression ring to the bottom of the outer ring of posts, were tensioned, pulling that ring up into position. 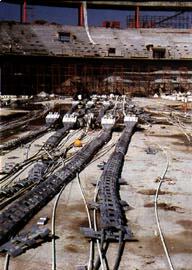 Thirty-two workers were positioned in baskets at the bottom of the compression posts to operate the jacks - two at each of the 16 ridge cables. Each jack held a single strand from a diagonal cable. The workers had to apply tension in perfect unison to raise the ring to a level position. The process was then repeated for each subsequent ring from the perimeter to the center until the network was in place. ODC had provided a central electronic panel to operate the jacks, but there were difficulties with power supply and the Korean contractors chose to operate the jacks manually instead. in a sea of tension." from rollers and attached to castings. The fabric cladding was installed by attaching it to aluminum castings that cover the ridge cables, says ODC project Vincent Bange. The castings have threaded metal studs that match holes in the outer fabric layer. The outer layer of fabric was installed first by Korean erectors from the central tension ring outward, unfurled from a roller held in position by a crane. The casting also has three attachment panels, which match three of the layers of inner fabric - the top and bottom of the 8-inch deep insulation bag and the vapor barrier below it. These layers are installed from the inside. Below the vapor barrier is an acoustic liner, which is basically zipped to the vapor barrier. "It's a normal zipper, sewn onto the liner and the vapor barrier in the shop. It eliminates the need to use heat sealing in the field - an obvious advantage," says Bange. Silicone rubber gaskets are installed on top of the castings for water protection. 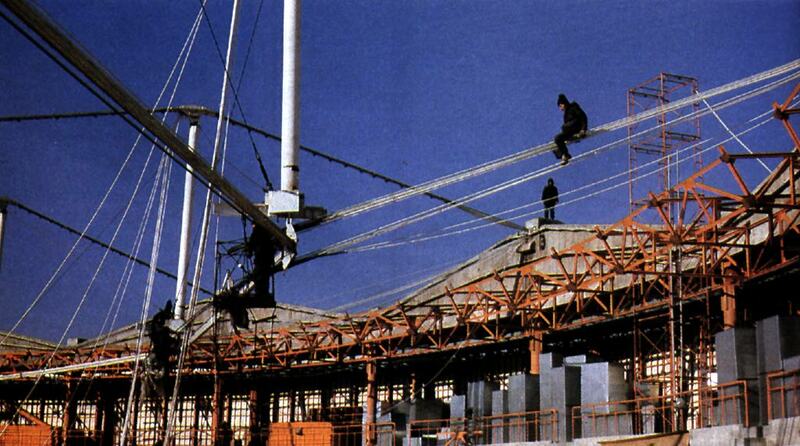 With the fabric in place, valley cables were installed on top of it between each two successive ridge cables to stress the fabric. Stefaniuk is now in Korea doing field testing to verify that the cable structures are exactly in position. "it's a first-of-a-kind dome, and we want it to be perfect," he says. "All of the members are highly stressed. We have to make sure there are no stresses beyond prudent design limits." 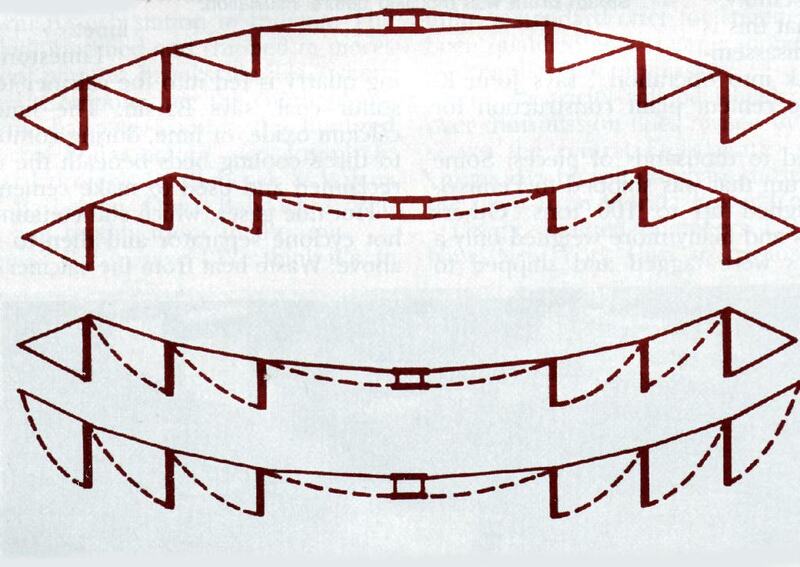 He points out that the exposed structure offers the ability to go back and verify cable tensions, and individual strands can be restressed from the compression ring if necessary. He says: "We started out with a promise. We weren't too sure how we would do it. It was a challenge, a thrill - not too many laughs - but it hasn't been dull."